"Interpretation of Dreams" redirects here. For other uses, see Interpretation of dreams (disambiguation). The Interpretation of Dreams (German: Die Traumdeutung) is an 1899 book by Sigmund Freud, the founder of psychoanalysis, in which the author introduces his theory of the unconscious with respect to dream interpretation, and discusses what would later become the theory of the Oedipus complex. 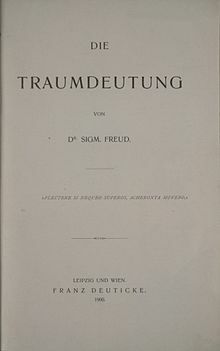 Freud revised the book at least eight times and, in the third edition, added an extensive section which treated dream symbolism very literally, following the influence of Wilhelm Stekel. Freud said of this work, "Insight such as this falls to one's lot but once in a lifetime." Dated 1900, the book was first published in an edition of 600 copies, which did not sell out for eight years. The Interpretation of Dreams later gained in popularity, and seven more editions were published in Freud's lifetime. Because of the book's length and complexity, Freud also wrote an abridged version called On Dreams. The original text is widely regarded as one of Freud's most significant works. While staying at Schloss Bellevue, Freud dreamed his famous dream of 'Irma's injection'. His reading and analysis of the dream allowed him to be exonerated from his mishandling of the treatment of a patient in 1895. In 1963, Belle Vue manor was demolished, but today a memorial plaque with just that inscription has been erected at the site by the Austrian Sigmund Freud Society. Dreams, in Freud's view, are formed as the result of two mental processes. The first process involves unconscious forces that construct a wish that is expressed by the dream, and the second is the process of censorship that forcibly distorts the expression of the wish. In Freud's view, all dreams are forms of "wish fulfillment" (later in Beyond the Pleasure Principle, Freud would discuss dreams which do not appear to be wish-fulfillment). Freud states: "My presumption that dreams can be interpreted at once puts me in opposition to the ruling theory of dreams and in fact to every theory of dreams..."
Freud advanced the idea that an analyst can differentiate between the manifest content and latent content of a dream. The manifest content refers to the remembered narrative that plays out in the dream itself. The latent content refers to the underlying meaning of the dream. During sleep, the unconscious condenses, displaces, and forms representations of the dream content, the latent content of which is often unrecognizable to the individual upon waking. Critics have argued that Freud's theory of dreams requires sexual interpretation. Freud, however, contested this criticism, noting that "the assertion that all dreams require a sexual interpretation, against which critics rage so incessantly, occurs nowhere in my Interpretation of Dreams. It is not to be found in any of the numerous editions of this book and is in obvious contradiction to other views expressed in it." Freud acknowledged that the interpretation of dreams is the royal road to a knowledge of the unconscious activities of the mind." Freud claimed that every dream has a connection point with an experience of the previous day. Though, the connection may be minor, as the dream content can be selected from any part of the dreamer's life. He described four possible sources of dreams: a) mentally significant experiences represented directly, b) several recent and significant experiences combined into a single unity by the dream, c) one or more recent and significant experiences which are represented in the content by the mention of a contemporary but indifferent experience, and d) an internal significant experience, such as a memory or train of thought, that is invariably represented in the dream by a mention of a recent but indifferent impression. Oftentimes people experience external stimuli, such as an alarm clock or music, being distorted and incorporated into their dreams. Freud explained that this is because "the mind is withdrawn from the external world during sleep, and it is unable to give it a correct interpretation ..." He further explained that our mind wishes to continue sleeping, and therefore will try to suppress external stimuli, weave the stimuli into the dream, compel a person to wake up, or encourage him or her to overcome it. Freud believed that dreams were picture-puzzles, and though they may appear nonsensical and worthless on the surface, through the process of interpretation they can form a "poetical phrase of the greatest beauty and significance." Dreams are brief compared to the range and abundance of dream thoughts. Through condensation or compression, dream content can be presented in one dream. Oftentimes, people may recall having more than one dream in a night. Freud explained that the content of all dreams occurring on the same night represents part of the same whole. He believed that separate dreams have the same meaning. Often the first dream is more distorted and the latter is more distinct. Displacement of dream content occurs when manifest content does not resemble the actual meaning of the dream. Displacement comes through the influence of a censorship agent. Representation in dreams is the causal relation between two things. Freud argues that two persons or objects can be combined into a single representation in a dream (see Freud's dream of his uncle and Friend R). An abridged version called On Dreams was published in 1901 as part of Lowenfeld and Kurella's Grenzfragen des Nerven und Seelenlebens. It was re-published in 1911 in slightly larger form as a book. On Dreams is also included in the 1953 edition and the second part of Freud's work on dreams, Volume Five, The Interpretation of Dreams II and On Dreams. It follows chapter seven in The Interpretation of Dreams and in this edition, is fifty-three pages in length. There are thirteen chapters in total and Freud directs the reader to The Interpretation of Dreams for further reading throughout On Dreams, in particular, in the final chapter. Immediately after its publication, Freud considered On Dreams as a shortened version of The Interpretation of Dreams. The English translation of On Dreams was first published in 1914 and the second English publication in the James Strachey translation from 1952. Freud investigates the subject of displacement and our inability to recognize our dreams. In chapter VI, page 659, he states: "It is the process of displacement which is chiefly responsible for our being unable to discover or recognize them in the dream-content" and he considers the issue of displacement in chapter VIII, page 671 as: "the most striking of the dream-work." "In the following pages, I shall demonstrate that there exists a psychological technique by which dreams may be interpreted and that upon the application of this method every dream will show itself to be a senseful psychological structure which may be introduced into an assignable place in the psychic activity of the waking state. I shall furthermore endeavor to explain the processes which give rise to the strangeness and obscurity of the dream, and to discover through them the psychic forces, which operate whether in combination or opposition, to produce the dream. This accomplished by investigation will terminate as it will reach the point where the problem of the dream meets broader problems, the solution of which must be attempted through other material." Freud begins his book in the first chapter titled "The Scientific Literature on the Problems of the Dream" by reviewing different scientific views on dream interpretation, which he finds interesting but not adequate. He then makes his argument by describing a number of dreams which he claims illustrate his theory. Freud describes three main types of dreams: 1. Direct prophecies received in the dream (chrematismos, oraculum); 2. The foretelling of a future event (orama, visio) 3. The symbolic dream, which requires interpretation (Interpretation of Dreams 5). Much of Freud's sources for analysis are in literature. Many of his most important dreams are his own — his method is inaugurated with an analysis of his dream "Irma's injection" — but many also come from patient case studies. The Interpretation of Dreams was first published in an edition of only 600 copies, and these took eight years to sell. The work subsequently gained popularity, and seven more editions were printed in Freud's lifetime, the last in 1929. The Swiss psychiatrist Eugen Bleuler wrote to Freud in October 1905 that he was convinced of the correctness of The Interpretation of Dreams as soon as he read it. Otto Rank was impressed by the work when he read it in 1905. Rank was moved to write a critical reanalysis of one of Freud's own dreams, and perhaps partly for this reason came to Freud's attention. It was with Rank's help that Freud published the work's second edition in 1909. The classicist Norman O. Brown described The Interpretation of Dreams as one of the great applications and extensions of the Socratic maxim "know thyself" in Life Against Death (1959). The philosopher Paul Ricœur described The Interpretation of Dreams as Freud's "first great book" in Freud and Philosophy (1965). He argued that like Freud's other works it posits a "semantics of desire". The mythologist Joseph Campbell described the book as an "epochal work", noting that it was "based on insights derived from years devoted to the fantasies of neurotics". Max Schur, Freud's physician and friend, has provided evidence that the first dream that Freud analyzed, his so-called "Irma dream" was not very disguised, but actually closely portrayed a medical disaster of Emma Steinbeck, one of Freud's patients. The psychologist Hans Eysenck argued in Decline and Fall of the Freudian Empire (1985) that the dreams Freud cites not only do not support his dream theory, but actually disprove it. The philosopher Mikkel Borch-Jacobsen and the psychologist Sonu Shamdasani argued in The Freud Files (2012) that Freud's analysis of the dream of Irma's injection was partly based on Belgian psychologist Joseph Delboeuf's analysis of the "dream of lizards and of the Asplenium Ruta muraria" in Sleep and Dreams. In their view, Freud's work should be placed in the context of the "introspective hypnotism" practiced by figures such as Auguste Forel, Eugen Bleuler, and Oskar Vogt. They charged Freud with selectively citing some authors on dreams (including Marie-Jean-Léon, Marquis d'Hervey de Saint Denys and Louis Ferdinand Alfred Maury), passing over others (including Jean-Martin Charcot, Pierre Janet, and Richard von Krafft-Ebing) in silence, and with systematically avoiding "citing the passages in the works of his predecessors which came closest to his own theories." Neuropsychoanalyst Mark Blechner maintains that even if one does not agree with Freud's theories that all dreams are wish-fulfillments and that the strangeness of dreams is due to mental disguise, The Interpretation of Dreams remains an extraordinary scientific record of dream texts and an analysis of the mental operations that dreams demonstrate. The first translation from German into English was completed by A. A. Brill, a Freudian psychoanalyst. Years later, an authorized translation by James Strachey was published. The most recent English translation is by Joyce Crick. The full text of The Interpretation of Dreams at Wikisource, a faithful copy of the third edition translated in English by Abraham Arden Brill and published in 1913 by The Macmillan Company. The Interpretation of Dreams at Bartebly, derived from the same edition as above. The Interpretation of Dreams at Psych Web, derived from the same edition as above. Die Traumdeutung at the Internet Archive, scans of the original text in German. Marinelli, Lydia and Andreas Mayer A. (2003) Dreaming by the Book: Freud's 'The Interpretation of Dreams' and the History of the Psychoanalytic Movement, New York: Other Press. ISBN 1-59051-009-7 (Mayer and Marinelli explore textual changes in different versions of The Interpretation of Dreams and offer an historical account of how the book became the founding text of the psychoanalytic movement). Mark J. Blechner (2001) The Dream Frontier. New York: Routledge. ^ a b "Freud's book, "The Interpretation of Dreams" released 1900". A Science Odyssey: People and Discoveries. PBS. 1998. Retrieved August 21, 2012. ^ Storr, Anthony (1989). Freud: A Very Short Introduction. Oxford: Oxford University Press. p. 41. ISBN 978-0-19-285455-1. "Freud had dreamed his famous dream of 'Irma's Injection'. "Freud's reading of the dream was that it was an attempt to absolve him from the responsibility of mishandling the treatment of a particular patient". ^ 1856-1939., Freud, Sigmund, (2010). The interpretation of dreams. Strachey, James. New York: Basic Books A Member of the Perseus Books Group. p. 121. ISBN 9780465019779. OCLC 434126117. ^ 1856-1939., Freud, Sigmund, (2010). The interpretation of dreams. Strachey, James. New York: Basic Books A Member of the Perseus Books Group. p. 205. ISBN 9780465019779. OCLC 434126117. ^ 1856-1939., Freud, Sigmund, (2010). The interpretation of dreams. Strachey, James. New York: Basic Books A Member of the Perseus Books Group. p. 407. ISBN 9780465019779. OCLC 434126117. ^ 1856-1939., Freud, Sigmund, (2010). The interpretation of dreams. Strachey, James. New York: Basic Books A Member of the Perseus Books Group. p. 604. ISBN 9780465019779. OCLC 434126117. ^ 1856-1939., Freud, Sigmund, (2010). The interpretation of dreams. Strachey, James. New York: Basic Books A Member of the Perseus Books Group. p. 192. ISBN 9780465019779. OCLC 434126117. ^ Freud, Sigmund (1955). Strachey, ed. The Interpretation of Dreams. Basic Books. p. 242. ISBN 978-0-465-01977-9. ^ 1856-1939., Freud, Sigmund, (2010). The interpretation of dreams. Strachey, James. New York: Basic Books A Member of the Perseus Books Group. p. 296. ISBN 9780465019779. OCLC 434126117. ^ 1856-1939., Freud, Sigmund, (2010). The interpretation of dreams. Strachey, James. New York: Basic Books A Member of the Perseus Books Group. p. 328. ISBN 9780465019779. OCLC 434126117. ^ 1856-1939., Freud, Sigmund, (2010). The interpretation of dreams. Strachey, James. New York: Basic Books A Member of the Perseus Books Group. pp. 162–163. ISBN 9780465019779. OCLC 434126117. ^ Freud, Sigmund (1953). The Interpretation of Dreams (Second Part) and On Dreams. London: The Hogarth Press. pp. Introduction 686 633. ISBN 0-7012-0067-7. ^ Freud, Sigmund (1953). The Interpretation of Dreams (Second Part) and On Dreams. London: The Hogarth Press. pp. 631–633 contents page 659 671 686. ISBN 0-7012-0067-7. "It is the process of displacement which is chiefly responsible for our being unable to discover or recognize the dream-thoughts in the dream-content" (page 659). "The heart of the problem lies in displacement" (page 671). ^ Freud, Sigmund (1953). The Interpretation of Dreams (Second Part) and On Dreams. London: The Hogarth Press. pp. 659 671. ISBN 0-7012-0067-7. ^ Borch-Jacobsen, Mikkel; Shamdasani, Sonu (2012). The Freud Files: An Inquiry into the History of Psychoanalysis. Cambridge: Cambridge University Press. p. 58. ISBN 978-0-521-72978-9. ^ Lieberman, E. James; Kramer, Robert (2012). The Letters of Sigmund Freud & Otto Rank: Inside Psychoanalysis. Baltimore: The Johns Hopkins University Press. pp. 1–2, 4. ISBN 978-1-4214-0354-0. ^ Brown, Norman O. (1985). Life Against Death: The Psychoanalytical Meaning of History. Hanover: Wesleyan University Press. p. 6. ISBN 0-8195-5148-1. ^ Ricœur, Paul (1970). Freud and Philosophy: An Essay on Interpretation. New Haven: Yale University Press. pp. 5–6. ISBN 0-300-02189-5. ^ Campbell, Joseph (1968). The Masks of God: Creative Mythology. London: Secker & Warburg. p. 650. ^ Eysenck, Hans (1986). Decline and Fall of the Freudian Empire. Harmondsworth: Pelican Books. pp. 35, 119. ISBN 0-14-022562-5. ^ Borch-Jacobsen, Mikkel; Shamdasani, Sonu (2012). The Freud Files: An Inquiry into the History of Psychoanalysis. Cambridge: Cambridge University Press. pp. 43, 111. ISBN 978-0-521-72978-9. ^ Blechner, M. J. (2013) What are dreams like and how does the brain make them that way? Contemporary Psychoanalysis, 49(2): 165-175.